At Found, we are supported with handmade inventory by over fifty people every month. So to better understand who these people are, we’re spotlighting one artist each month. We want to know what’s behind the art, the artist, the designs and mainly, the woman. As 98% of our Found makers are women, we’re shining a light on what’s made her in a new blog series. First up, Emily Gibbons (EG) ––jewelry designer, painter, mom, and generally driven woman–– was interviewed by Found Natural Goods Founder, Jacqueline Smith (JS) for over an hour with coffee in hand under the unusually warm winter sunshine at Looney Bean's riverfront garden next door to our brick-and-mortar on Brooks Street downtown Bend, Oregon. JS: I’m choosing you first [Emily] because you’re my friend and I’m not totally clear on my questions. EG: [laughs] Well, I’ll try my best! JS: Ok, so was there a moment when you knew you wanted to make jewelry? EG: Yeah. I had just finished school, and I was a painting major in college and I was really dedicated to it. But when I moved into an apartment with Colby, I didn’t have space for painting and it was kind of toxic ––I worked in oil paint–– to have in my home space. But, I had this like, this need to make something. I saw a magazine article about making your own simple necklaces, and I was instantly curious, and eventually went to a bead store and it was like, oh my gosh, yes. I got some wire, pliers, and a wire cutting tool and I started dabbling around and playing with it. It was so exciting to be there in this space with all the beads and color. I was excited to wear something that I actually made. At that time, I was teaching yoga and I started getting a lot of comments on the jewelry I was wearing. And then, about 6 months into it, a friend of mine who was also a jeweler was opening up her own store. She asked me to sell some of my pieces on consignment, and gave me a few professional tips about materials and presentation. JS: Wait, wait, wait –– let’s backtrack –– when was this and where in the world are we? EG: Good question. It was probably, wow about 10 years ago now in Austin, Texas. I’d just put painting on the back burner. Those first initial pieces were really organic, wire-wrapped, gemstone and kind of crude but they actually sold. JS: And those first pieces, were they similar to what you’re making now? EG: Kind of. In some ways, yes, but in other ways, no. I’ve simplified what I do. These were all one-of-a-kind pieces with more focus on intricate wire wrapping and bigger, more organic shapes. JS: What drove you to learn metalsmithing? EG: Honestly I got a little tired of the limits that I had with just wire wrapping, and I got a little sick of doing the same thing over and over. It was half accessibility and half finding my own style and technique, branching out of my comfort zone and working through a challenge. I have never taken a jewelry class so my techniques and styles have evolved in a pretty organic and unique way. I think that has helped me keep an individual look to my work. I also don't use any heat in my studio, no soldering or casting, so I have this challenge that I like... I try to do things with the limits I have set in place, and work within that challenge to create something new. It’s fun right now, but in the future, I might be ready to branch out into more traditional techniques while still holding on to my own style and look. My main motivation that’s driven me has been my own taste and what I want to wear. Trying to blend it to where it was still noticeably my style but more simplistic and refined. JS: Especially in a saturated and competitive market. JS: One thing you mentioned was your first trip to the bead store. Tell me about that. EG: For me what made it so exciting, coming from a painting background, is it’s another form of a pallet and I love gemstones that have texture, the way they reflect light. In my studio space, I don’t organize or compartmentalize the stones and metals. They’re all laid out on the table and it’s messy and usually, I don’t have a plan when I’m making something new. I just pick some stones that draw my attention, and then start to play with metals and wire to create a new and exciting piece or collection. I may have an idea, but today metal has more of an influence on me and I love to accent it with beads. Once I started getting more into hand-cutting, hammering, texturizing and shaping the metal it became more fun and interesting to me than beadwork. But I still love working with gemstones... adding in what could now be called expertise in that field of wire wrapping and weaving the stones into and around metals. JS: Oh, wow I love that. It’s so counterintuitive to what I perceived your process being. So, at one point you mentioned having this need to create. Can you elaborate on that feeling? Is it inside of you? EG: You know, I think everybody has their own things that drive them, and I can just remember ever since being a child ––and my sister’s the same way, she’s also an artist–– we were really encouraged by our mom, also an artist, to make and create things. I get into a zone, I feel happy, relaxed, excited, and driven when I sit down in my space. The excitement of making something beautiful out of raw materials just doesn’t get old for me. I still love painting, making little sculptures, drawing...but for me, making jewelry is a combination of all of that. I guess today that’s where I find a really large amount of meaning in my life. It’s creating and having that process evolve into something functional. JS: Ah, the creative process. EG: And you know now, having a family, it’s not as much as a desire to grow and expand the business but it’s the one thing that’s for me that I want to hold on to as I raise my boy, soon to be two boys. Because everything else is for other people. I’ve got to be able to hold onto it for myself and push for creativity and exploration. I think that if I can manage to keep this part of myself, I will be happier and more purpose-driven in raising children. It’s truly impossible to ever find real balance, but we can strive for it, right? JS: Yes. So true. Ok, ok, ok –– let’s jump back to the main thought this blog series was born of; what’s made you as an artist? EG: It’s such a generic answer but it’s true. It's having that inherent drive to create, and being inspired nature. But nature is everything. You know, you’re looking at a piece of bark on a tree, how the light reflects off of it and you want to make something that sparks the same feeling of taking in that beauty all around us... that looks organic and has that natural light play, even though it begins as a rigid, hard piece of metal. My work is reflected in nature because everything is kind of organic, and unplanned and not perfect––and I’m a pretty messy, unplanned person. JS: But that’s what’s so beautiful about you! EG: If I didn’t have the responsibilities that adult life and family brings, I’d probably be more of a wandering soul. One of the biggest challenges that I’ve faced with being in jewelry ––which is similar to fashion–– are the seasonal demands and competition behind that concept. Coming out with an entirely new collection every couple of months, I’ve learned, now that I’m more established and settled in my own comfort level, I can play with different ideas and styles seasonally and hold on to the staples from each line. I have found what works for me is a less rigid timeline or deadlines. I love working with smaller and independent boutiques where I am able to customize collections and collaborate with my retail partners like you for those unique spaces and their clientele. So you won’t see all the same pieces at every shop I sell my work in. In some ways, that forces me to keep this business small, but for right now that works perfectly with the other obligations I have in my life. JS: Sweet. Um, lastly, what’s your tip for someone curious about taking the leap from a hobby to launching a small business from their passion (be it jewelry or another creative expression)? EG: I spent a lot of time in my twenties not having a clear vision of what I wanted to do. Today I know it’s really helpful to spend time thinking, writing, and putting out real clear objectives on what you do want and the goals you have. Then put a real force behind that and without the distractions of other pursuits and side-jobs that you don’t want to be your career, that is not quick money, but that is fulfilling. Give it everything. It took everything I had to get this going from a hobby to a legitimate business. I gave up a lot of my life and financial security to work towards this goal. I have to give my husband credit for that... a few years ago he said to me pretty point blank: stop daydreaming and really go for it, or get a real job that you can rely on. I was terrified of having an office job and just as scared of continuing to work in the service industry. I loved teaching yoga but it didn’t fulfill me in the same way that creating my own artistic business would, so basically, bite the bullet. 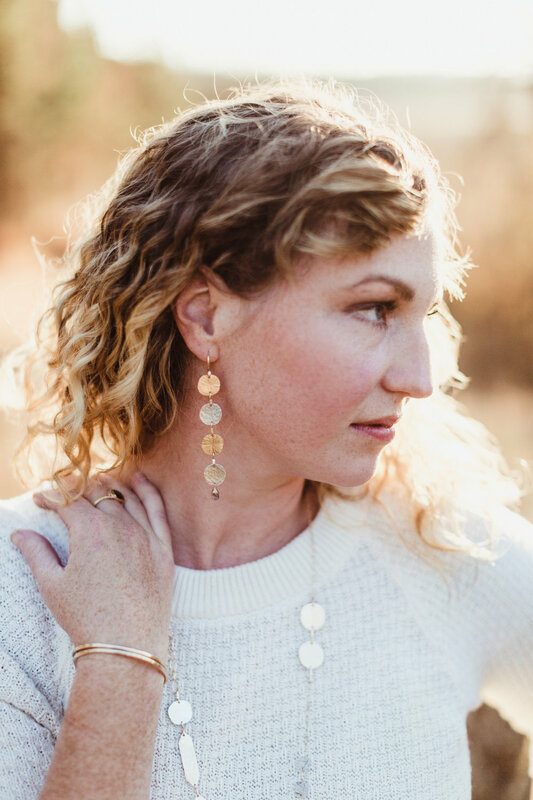 Discover Emily’s handiwork on her site here ––Emily Gibbons Jewelry–– or come into Found Natural Goods for a full display of her work in-person. Now, the real question, which Found artist is next?